Parsnip facts, an information sheet for kids cooking activities. 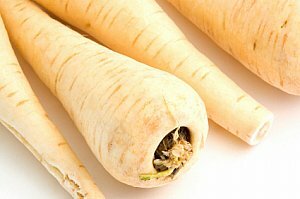 Parsnip facts and general information about parsnips. Parsnips grow underground as a root vegetable. Parsnips look like white carrots. Pick crisp and unblemished. Peel, cut up and cook in soups or vegetable side dishes. Place chopped parsnip in casserole dish. In small frying pan, sauté garlic in butter. Pour over parsnip and bake at 375 degrees for 25-30 minutes. *Add chopped parsnips to your stews or soups. Peel the parsnips and cut into equally sized small 'sticks' - lay out on paper towels so they dry well. In a large heavy skillet, melt the butter over medium heat. Add the parsnip sticks, stirring gently to coat them well with the butter. Sprinkle the nutmeg over the parsnips and stir again to coat. Cover the skillet tightly with either a lid or aluminum foil, turn the heat down to low heat, cooking slowly for 8 to 10 minutes. The parsnips should be tender and slightly caramelized. Taste and add salt and pepper if desired.